Story / Music: listen to the story"Cheecheeshkirhee"
I send these words to you, To Father Sun, Grandmother Moon, To all of my relations, To Mother Earth, And to the Four Winds The Sacred Seasons of Life. Today you gave The breath of Life To an Indian Child, In a most Sacred Way. This Indian Child Will walk amongst His people, With his head held high, With dignity and pride, In a most Sacred Way. This Indian Child Will stand before His people, With honor And respect, In a most Sacred Way. This Indian Child Will be strong With wisdom, knowledge And understanding, That will come from The heart, soul and mind, In a most Sacred Way. This Indian Child Will come before A humble Nation of people, And like his relations The Eagle and the Buffalo Will be their strength In a most Sacred Way. 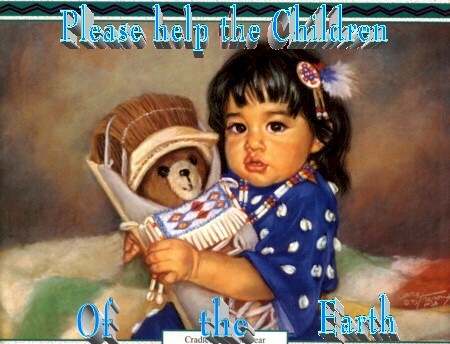 This Indian Child You gave to us in a sacred way, And with his eyes He will see all that is good, And with his ears, He will hear all that is good, And the words he will speak Will be strong and powerful, In a most Sacred Way. This Indian Child That you have brought before us, Your Native American Indian people, Will be like his Ancestor's That have gone before him On their journey, Will always travel Within the Sacred Circle of Life In a most Sacred Way. This Indian Child Will use His Eagle Feathers, His Sacred Pipe, His Sacred Cedar, His Sacred Sage, His Sacred Sweetgrass, His Drums and Songs In his Sacred Sun Dance, In his Sacred Sweat Lodge, In his Sacred Ceremonies, In a most Sacred Way. This Indian Child will be strong within, His tradition, culture And religion, An intricate heritage, In a most Sacred Way. Thank you for each breath of life That you have given to our New Born, For tomorrow, Another Indian Child Will be born the "Indian Way."